Kirk: You have all the consoles, Fahey, so how do you see the Xbox One X fitting into your gaming ecosystem? Fahey: Well, let’s put it this way: Now that I’ve completed my review of the Xbox One X, it’s still hooked up to an HDR 4K TV, and there’s a few things I’ll go and check out some more, and I’ll check out other games as their enhancements get downloaded, and see if that changes them significantly. But I’m glad to go back to my PlayStation 4 Pro. Fahey: The game library is what it comes down to. My tastes lean toward anime-type stuff: RPGs, rhythm games. PlayStation 4 has all of that. The Xbox One X, and Xbox in general, has a lot of the same standard triple-A games, not so many indie games, and an absolute dearth of Japanese imports because the Xbox One is nothing in Japan. It’s hard to say where the Xbox One X fits in. It wants to be competitive with the PlayStation 4 Pro—you can see that in the specs. Kirk: And it should be said, it’s a much more powerful console. Fahey: It’s like 1.4 times more powerful than the PlayStation 4 [Pro] is what the spec from Microsoft was bandying about. And it does have an Ultra-HD Blu-ray player, and the PlayStation 4 does not have that. But it also only plays Xbox games, there’s not a lot of them, the exclusives the Xbox One gets aren’t as amazing as, say, Horizon: Zero Dawn. Kirk: And you can play them on PC. Forza Horizon 3, for example, I love that game but I play it on PC, I don’t play it on Xbox One. Fahey: And the thing is, 4K is more important on the PC, because you sit at a desk, you’re a couple feet away from your monitor. So that pixel density makes a big difference. There are charts online that show you the viewing distance for a 55-inch 4K TV, for it to make a difference with the human eye, and it’s like, you have to be 3.5 feet away for it to really make a difference. And I’m not sitting 3.5 feet away from my 4K TV. Fahey: If someone had no console at all right now, and they didn’t have an HDR TV and a 4K TV, and they said I have no console, I want to play the system with the most games, that’s PlayStation. It’s hands down PlayStation. The Xbox One’s been struggling to keep up with the PlayStation since 2013. And it’s almost as if— PlayStation’s had two iterations, but Microsoft’s done three, and it’s almost as if they brought their sandwich to the sandwich building contest and they’re like ‘Nope, yours isn’t good enough’ and Microsoft says, ‘Hold on a sec,’ and they lift the bread up and throw some more stuff in there and they’re like, ‘How about now?’ ‘Not quite.’ And [Microsoft] says ‘Be right back. Here we go. Four times the meat. How about now?’ It’s still the same sandwich, but okay. 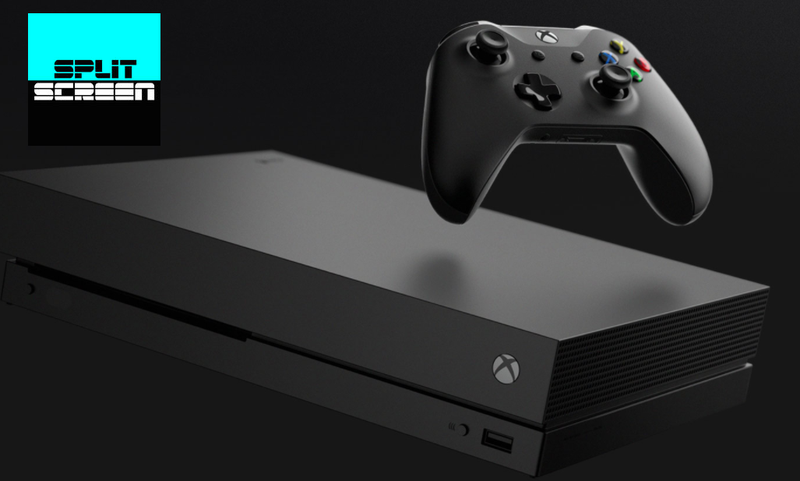 There’s lots more discussion of the Xbox One X and much more. As always, you can find Splitscreen on Apple Podcasts and Google Play. Leave us a review if you like what you hear, and reach us at splitscreen@kotaku.com with any and all questions, requests, and suggestions.